The origins of “Le Feu” are shrouded in uncertainty. 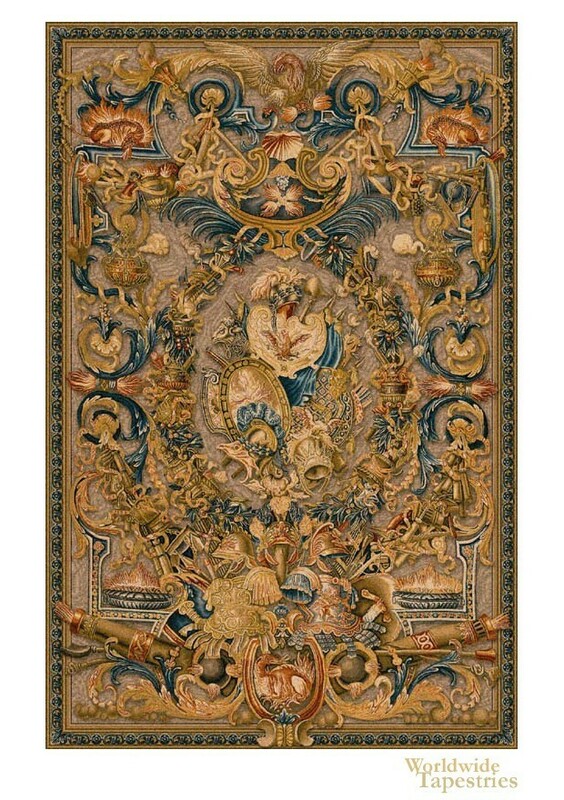 But one thing is for certain: This is one of the most elegant and intricately woven tapestries ever created. It is believed that “Le Feu” was once assigned to the workshop of the convent of the religious Saint Joseph, rue Saint Dominique in Paris. Best estimates are that it was woven in the 17th century and that the original design was a coat of arms used as a design for an extravagant door. The original is still on display at Chateau Versailles. This version of “Le Feu” is woven to the exact specifications as the original and captures all its beauty and ornate detailing. The rich colors and vibrant designs will instantly capture and hold your imagination. This tapestry is lined and has a tunnel for easy hanging. Dimensions: W 55" x H 82"
Dimensions: W 71" x H 115"